Okay… not so suddenly! It’s taken me a while to understand the process of socks, so I’m being a bit tongue-in-cheek with my title. Having had a “sock block” for a while and with my 2014 New Year crochet resolution to make socks unfulfilled, I revisited the sock thing this summer. I thought it would be better to not worry about making a pair of socks until I’d got my head around their anatomy and the process of making them. 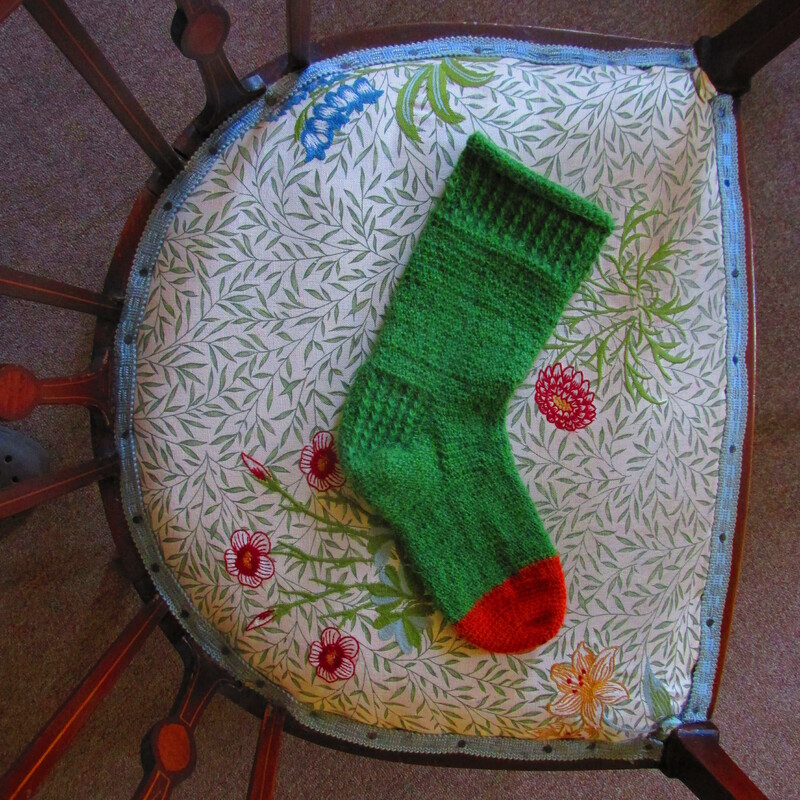 I dug out all the sock patterns I could find, and turned up eight – four were cuff down and four were toe-up. I decided to try and make one of each of these. I’d failed to understand three patterns… but something clicked on the fourth (Rohn Strong’s Dowding Socks from Inside Crochet issue 34/October 2012) It’s worth noting that I’d had trouble with a couple of his other patterns – slight alterations in the way patterns are written can make huge differences to the nescient sock-maker! Here is my first completed sock. It’s a bit misshapen as I started on a 3.5mm hook but this was too large for my tension so switched down to a 3mm halfway through the project..
…and then got carried away dreaming up my own designs (dreaming being the operative word as I have lots of ideas yet to be tested). You see, while I like hand-made socks and the wide range of patterns for knitted socks, I cannot really be bothered with the faff of DPNs! But crocheted socks often aren’t very imaginative and seem quite samey. 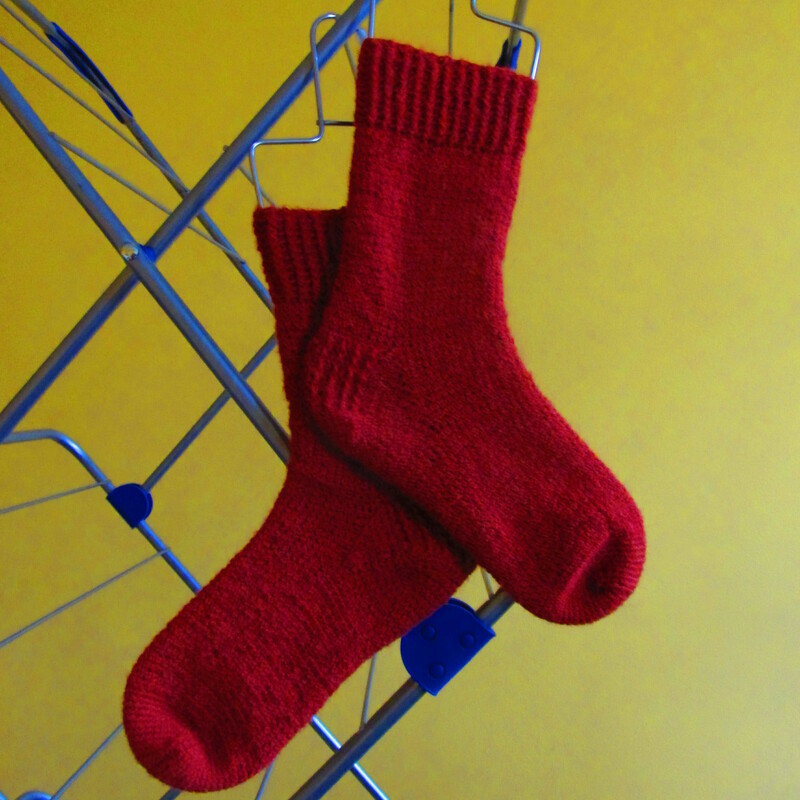 My favourite pattern on Ravelry is Patsy Harbor’s Honeycomb Sock http://www.ravelry.com/patterns/library/honeycomb-socks-3 . Inspired by these, I’m on a mission to design intricate, beautiful, wildly different crocheted socks. Wish me luck! A friend recently told me she’d come to a standstill with her knitting as she always seemed make things she either never wore or had no use for. When it came to household items, she’d done enough cushion covers, and one throw was enough. On top of this, she’d made enough for friends and family that they were replete with knitted goods and also needed no more. She said, and I quote: “I’m reduced to knitting clothes for my niece’s dolls although the doll always seems to be naked whenever I see it!” I suggested she make socks, as everyone always needs socks! This reminded me. I still haven’t addressed my New Year Resolution to make socks. So I turned my attention to that in the past few days.. and got stuck on two different patterns! Annoying!! The first was a toe-up design which seemed simple enough – no fancy cables or anything. But I got to the heel and couldn’t work out how to proceed. I very nearly unravelled the whole lot in a strop, but stopped myself knowing that I’d regret it. If I could work out how the heel works from other patterns, I thought I might be able to muddle through. So.. I turned to another pattern to see if that elucidated things. 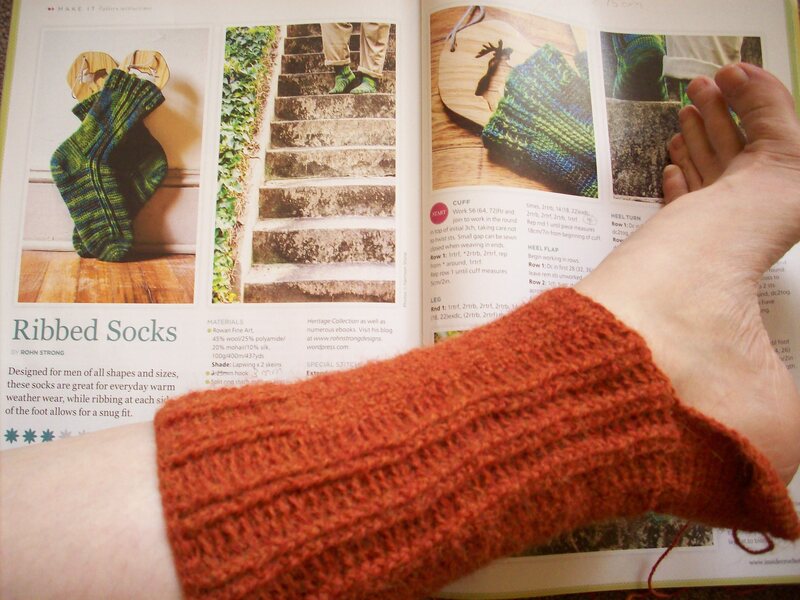 As a cuff-down pattern, working the heel would be a different method anyway. 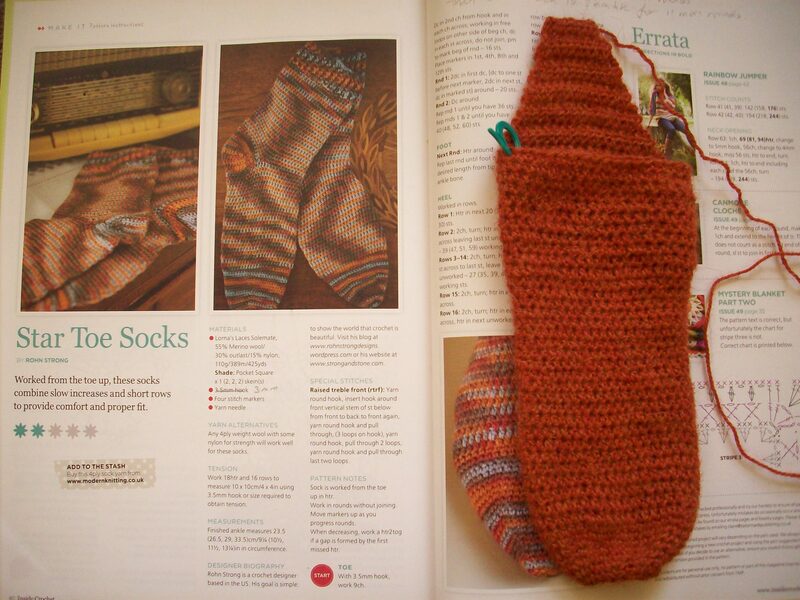 But I really liked the look of these socks, and was doing very well – until I got to the heel again! Perhaps trying another pattern by the same designer wasn’t a good idea as maybe I just don’t click with his pattern-writing style.. Meanwhile I’ve had a look at other sock patterns, but don’t really fancy having a go at them as they are lacy, which bring to mind the socks I wore as a schoolgirl! I guess the sock resolution will have to be shelved until I can get past this sock block.